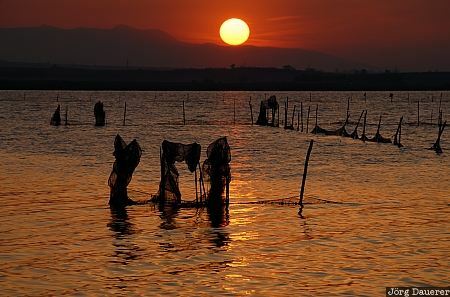 The sun is setting over Lago di Lesina behind fishing nets on the Gargano peninsula in Apulia (Puglia), province of Foggia in southern Italy. This photo was taken on the evening of a sunny day in April of 2006. This photo was taken with a digital camera.